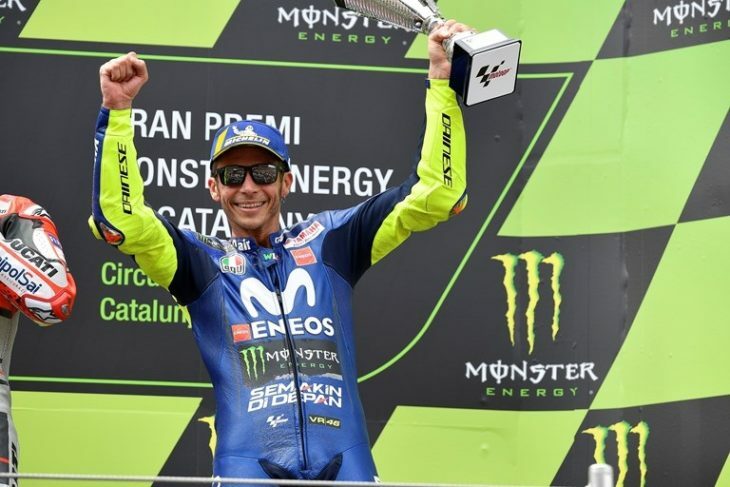 Movistar Yamaha MotoGP’s Valentino Rossi has taken his third consecutive third-place finish in the 2018 MotoGP World Championship at today’s Gran Premi Monster Energy de Catalunya. Teammate Maverick Viñales endured a tough start at the Circuit de Barcelona-Catalunya. He placed mid-pack after the start but made up positions in the second half of the race to take sixth place crossing the finish line. Rossi’s third place keeps him in second position in the championship standings with 88 points, 11 points ahead of teammate Viñales, who remains in third position. Yamaha moved down to third place in the Constructor Championship, with a 26-point margin to first, while the Movistar Yamaha MotoGP Team remain in first position in the team standings and now have a 10-point gap to the second team. On the other side of the garage, Hafizh Syahrin did an incredible race, after launching off the line from P14, he performed in a determined way, whereas he fought his way through to ninth. Unfortunately, he highsided with just a few laps to go and therefore, already sets his sights on the Dutch Grand Prix, where he aims to make up for the lost points in just 12 days’ time.